My dad has finally found someone new. After my mom died, which was only a year ago he found someone. He told me that the women had children, 2 boys and 2 girls. Three of them were off in college. The other boy was still 18 and in high school like me. When he told me she was moving in I was immediately mad. Then he told me I was switching schools so it would be easier to drop the boy and I off. "Callie Sam and his mom are moving in tonight"my dad yelled. I just rolled my eyes. I was at my desk writing my complete and utter thoughts. My curtains were pulled apart so I could see outside. It was the middle of spring so it was so beautiful. It was chilly but hot at the same time. For my relax clothes I had on a black tank top, leggings, and a maroon cardigan. Almost what I wore everyday. I wasn&apos;t gonna be like most and show every part of my skin. I sat at my desk thinking. I&apos;ve never even met this women or her kid. Apparently his name was Samuel but my dad called him Sam for short. My dad moved on so quickly. I wasn&apos;t happy with it but I had to live with it. I look outside seeing a moving truck pull up. Out walked a tall boy and his mom with brunette hair and beautiful eyes. I went downstairs to greet them. Although I hated the fact he was still going to be with her. I went down and saw my dad helping her with her stuff. I just sat back and watched for a minute. Then she came up to me and hugged me. Then Sam just glared at me like I was something out of the trash. "Cal go show Sam his room"my dad said. I just stood there and rolled my eyes. I waved my hand for him to follow me. We walked up the stairs and he had a box of his stuff with him. I lead him to his room and he immediately went in and slammed the door. I rolled my eyes at how fricking annoying this already is. I walked into my room and shut my door. It was now 8pm and I was laying in bed listening to music. Then Sam came in my room. "Listen as much as I hate the idea my mom wants me to bring you to the party with me that my friends are having, so change please, and meet me downstairs"he said disgusted almost. I just rolled my eyes. I actually wanted to look decent especially if the people there will be going to my school. I left my black leggings on, I also wore a tribal flows crop top, and some slip ons. I left my hair in its perfect wavy brunette form, put on eyeliner, and mascara. I also put on some concealer and lip balm. I actually looked really good. I went downstairs to see Sam on the couch. He looked at me and slightly smirked. "What"i said giving him attitude. "You uh- you look nice"he said. Then he paused and turned around. "Maybe a little to good, guys are gonna state, you should change"he said. I just stood there shocked. "Shut up let&apos;s go"i said. We arrived at the party and immediately smelt beer. 2 boys ran up to Sam and almost tackled him. "Yo bro you came"the blonde one yelled. "Dude we got some major beer and alcohol"the brunette said. "Whos that" the blonde said pointing to me. "Thats Callie, callie this is Jack J and Nate"hesaid pointing to them. I nodded and waved. 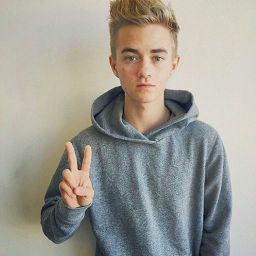 Jack j wiggled his eyebrows at me, and by then I was going to leave. I went into the kitchen and grabbed myself a cup and poured some beer in it. I go and sit on the couch just watching everyone. Someone came by and asked if I wanted a shot, I said sure and I took 2. I was not a light weight so I just got a light buzz. A girl maybe the same age as me came by and sat next to me. "So your Sam&apos;s friend, Callie right. Hi I&apos;m Grace. "she said. "You could say that. And yes I am. And hi grace"i said and started to laugh. Her and I talked for a long time then she ended up leaving because she had to be home. Then a boy replaced her place on the couch. He looked my age. He said his name was David. I ended up talking to him. And Sam kept looking at us from afar. After a while David kept getting closer, I saw as the closer David got, the more Sam moved closer to us. David got super close and Sam ran up grabbing me. "We have to go callie"he said and eyed David. I waved bye and walked out with Sam. "Sam what&apos;s up your but"i yelled when we got in his car. He started the car and pulled out. "so your not going to answer"I said. "Nothhin Callie, Nothing.g at all. He&apos;s just a jerk"after that he went silent and so was the rest of the car ride. We pulled into the driveway and we both walked into the house. Our parents were asleep. "I&apos;m sorry Sam, I&apos;m sorry all this happens. And I&apos;m sorry I ended up talking to the wrong guy. I&apos;m sorry-"then I was cut off by his lips. When he kissed me my stomach flipped. I just kissed back. He licked the bottom of my lip to ask for an entrance. And I gave him exactly that. After he came to realization, he pulled away. He just looked at me and ran upstairs. Sam never talks to me. He always has different girls over and it sometimes made me jealous. I thought he felt something. The first 3 days after we kissed he ignored me, and he still is. But after those three days I became more and more upset. I would run away from him and try to keep my distance. He would leave for school early so we didn&apos;t see each other. And whenever it was dinner time I always was eating in my room. Even though I couldn&apos;t eat. I was in my room and Sam&apos;s mom came into give me my food. She set it on my desk. She walked over and sat at the end of my bed. I folded my legs up and held then to my chest. "Honey, I know you and Sam kissed. No he didn&apos;t tell me. But I&apos;m a mom I can tell"she said. I just sat there and nooded. "Cal, I had the same talk with him. I told him it was fine if you date, just because your dad and I are doesn&apos;t mean anything because you guys aren&apos;t blood related and you guys are not even siblings. Although it sounds weird, it&apos;s quite normal" she sat there and looked at me. She continued. "He&apos;s out right now, I tracked his phone, he&apos;s at the park. I think he&apos;s getting high. I know my son. "After she said that I shot up. He&apos;s getting high. "I&apos;m going out"I yelled. They just said okay. I ran towards the park. As I was half way there I noticed how bad I looked. I wore leggings, a black tank top, and a white cardigan. I still kept running. I saw his shadow in the dark and ran up to him. "Sam" I yelled before he could put the blunt in his mouth. I ran and jumped on him. Luckily he cought me. I almost immediately put my lips on his. My hair falling on his face, it was just perfect.